In the age of the internet, privacy is an important and controversial issue. But what do privacy rights mean for children? RightsInfo takes a look. Initiatives like the EU’s General Data Protection Regulation (GDPR), and the Government’s new Data Protection Act (which brought the GDPR into UK law), have tried to address the new role of technology in our lives, giving us more control over how our data is being used. Still, with the internet extending across national boundaries, some privacy laws can be hard to enforce. If protecting privacy online is difficult for adults, it’s even more complicated for children. But, with a third of internet users under the age of 18, it’s also a question that’s more important than ever before. We look at what the law says about how to protect children’s right to privacy and why there are no straightforward solutions. Children are also covered by the same protections given to adults in Article 8 of the Human Rights Convention. The value of the UNCRC is that it recognises the unique status and requirements of children, including parental protection and the importance of an education. Under the UK’s new Data Protection Act, which became law in May of this year, children can consent to information services at 13. One of the benefits of this policy is that children are able to engage freely with the internet, which is an important and largely unavoidable tool. However, Ofcom, the government’s communications regulator, points out that children often struggle to distinguish between information and paid content online. Some critics of the Act argue that, if children aren’t able to recognise advertisements, they also won’t be able fully to understand how companies use their personal data – nullifying consent. There are also practical questions about expecting websites to check the ages of their users. Another issue is children’s ability to make reasonable choices about what to share about themselves online. Parents will also often share images of their children without asking for consent. Although GDPR guarantees the right to be forgotten, the more something is shared on the internet the more difficult it is to erase. As so many people who have been filmed saying something regrettable or dancing like (they thought) no one was watching have discovered, once something is online, it tends to stay there. While the law guarantees children the right to privacy, the nature of the internet can make that right difficult to enforce. 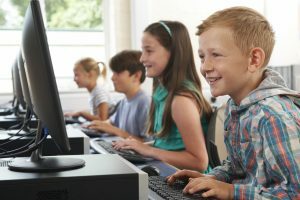 Rather than trying to keep children off the internet, which – let’s face it – isn’t going to happen, we should be focusing on better educating children in media literacy. Schools and parents must work together to teach children how to protect their privacy online.